League One leaders Luton's run of six successive wins was ended as they were held to a 1-1 draw by Coventry at Kenilworth Road. 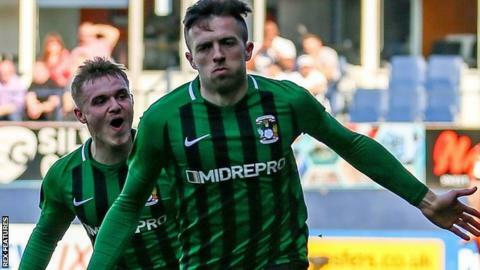 Matty Pearson headed Town in front after 16 minutes but substitute Jordan Shipley drew Coventry level before the break and neither side could fashion a winner. The hosts had two good chances early on, James Collins and Andrew Shinnie both firing over the top. Shinnie had another attempt wide of the mark, before Luton took the lead when James Justin's corner was headed home by the unmarked Pearson. City were level after 34 minutes, though, as Jordy Hiwula got to the byline and pulled it back for Shipley - who had only been on the pitch four minutes - to find the net. Visiting midfielder Luke Thomas then missed the target from range, while in the second half, Town skipper Sonny Bradley's header was cleared off the line by Liam Kelly. Shinnie's effort deflected inches past the post, while team-mate Pelly-Ruddock Mpanzu also could not find the net with his angled attempt. City had a late chance, Dominic Hyam heading over, but Luton should have won it in stoppage time, an unmarked Alan McCormack firing straight at keeper Lee Burge from five yards.